Chelyabinsk, the Russian city that made headlines with its meteorite, triple sun and blue snow, has been hit by a new natural phenomenon. 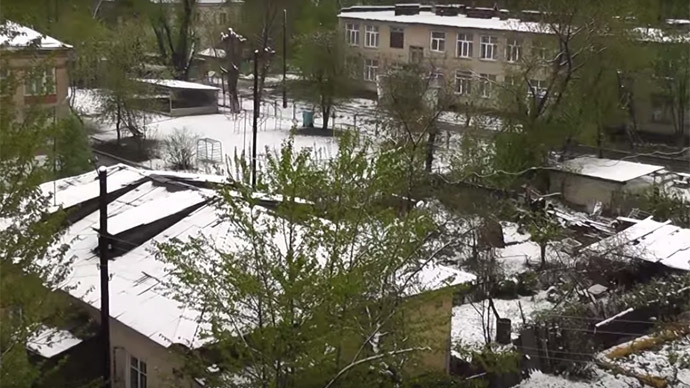 The city in the Southern Urals marked May 9 with a sudden snowfall so thick it left 39,000 people without power. The wintry weather, which started on May 9,hasn’t discouraged social media users who were preparing to mark 70 years since victory over Nazi Germany in WWII. They marked the words “May 9” in the snow, and drew pictures of St. George’s ribbons on their snowy cars. The snow also damaged power lines in the city and left about 39,000 people without electricity, regional energy officials said. Chelyabinsk is no stranger to strange natural occurrences. On February 15, 2013, Chelyabinsk made global headlines after a blazing meteor flashed across the sky. Its impact in the atmosphere had the power of over 20 Hiroshima explosions. Luckily, the explosion occurred about 30 to 40km over the city and the meteor didn’t make an unwelcome crash landing in the middle of the city. There were no serious casualties, but about 1,600 people received minor injuries, mostly from fragments of shattered glass. The biggest fragment of the meteorite weighed in at around 570 kilograms and was found in Lake Chebarkul, 90 km from Chelyabinsk. This February city residents were awed by a new phenomenon, a triple sun, a rare optical illusion produced by ice crystals in the winter air. Also in February, another strange event was the appearance of smurf-colored snowflakes covering the city’s streets. It turned out to be that a local factory making dye for Easter eggs had a spill.